Every summer, the Visual Arts at Chautauqua Institution (VACI) presents 11 exhibitions in the newly renovated Strohl Art Center, Fowler-Kellogg Art Center and the Melvin Johnson Sculpture Garden. These diverse spaces allow VACI to host a variety of contemporary shows from nationally recognized artists. VACI strives to exhibit a balance of two and three-dimensional works, specifically curated for its gallery spaces. 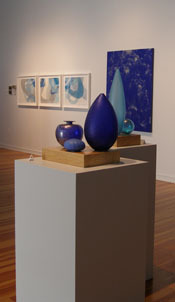 The galleries present contemporary as well as historically based exhibitions. VACI encourages engagement with an expansive range of critical issues in the Visual Arts, and attracts distinguished exhibitors and renowned guest artists and faculty. Find more information about the Visual Arts at Chautauqua Institution: www.ciweb.org.